Bohemian town, on the right bank of the River Eger. The population of Eger in 1890 was 17,148, including 508 Jews. The oldest document mentioning the Jews is dated March 12, 1314, and refuses them permission to inhabit a new street near the monastery. They are again mentioned in a document of Oct. 23, 1322, in which the emperor Louis the Bavarian pledges Eger to John, King of Bohemia. Louis annulled all the debts of Abbot Griebel of Waldsassen to the Jews. At that time the Jews inhabited a special part of the city called "Unter den Juden." About 1332, under Charles IV., many rich Jews settled in Eger, where they succeeded so well that in a short time the Jews formed one-fourth the population of the town. They had then a high school, a synagogue, a synagogue courtyard ("Judenhoff"), a house for the cantor, and a cemetery. Their wealth aroused the jealousy of the other inhabitants. The charges against the Jews at the time of the Black Death (1348) reached Eger on March 25, 1349; and in 1350 they were suddenly attacked by the mob, incited by a monk's preaching; nearly all were massacred, their goods appropriated, and their books taken to the town hall, whence they were sent to the Imperial Library of Prague. The street where this occurred still bears the name "Mordgässchen." On May 15 the citizens were absolved from all guilt in the matter by Charles IV. himself. It seems that the few survivors fled to Königsberg, a neighboring town, where they gave Jewish burial to many of the dead whom they had carried with them. Some Jews returned to Eger shortly after this, for four "Judenmeister" (rabbis) are mentioned in 1352, and a tombstone of a Jewess, "Kele" (1353), is still to be seen. They repurchased from Albrecht Nothheft, the "Landvogt," their synagogue, school, and cemetery. This purchase was confirmed by Charles Nov. 6, 1364. On Jan. 25, 1379, King Wenzel formally declared that the Jews of Eger were his serfs ("Kammerknechte"), and that they could be summoned only before the royal judge of the town; they were thus protected against the injustice of the popular authorities. Two years later, May 5, 1381, he freed the Jews of Eger (together with other inhabitants) from taxes for five years in return for financial assistance. In 1390 he remitted all debts due the Jews. He included them in the safe-conduct given (1391) to the inhabitants of the city, so that they had protection within the empire and in Bohemia. Many documents of the fifteenth and sixteenth centuries evidence the jealousy aroused through their success by the "Jewish bread-thieves." In 1410 they had their own "Tanzhaus" in the "Judengasse." In the fifteenth century, during the Hussite troubles, a deputation from Eger complained to King Sigismund (1430) that the Jews, on the strength of their old privileges, were not performing military service. 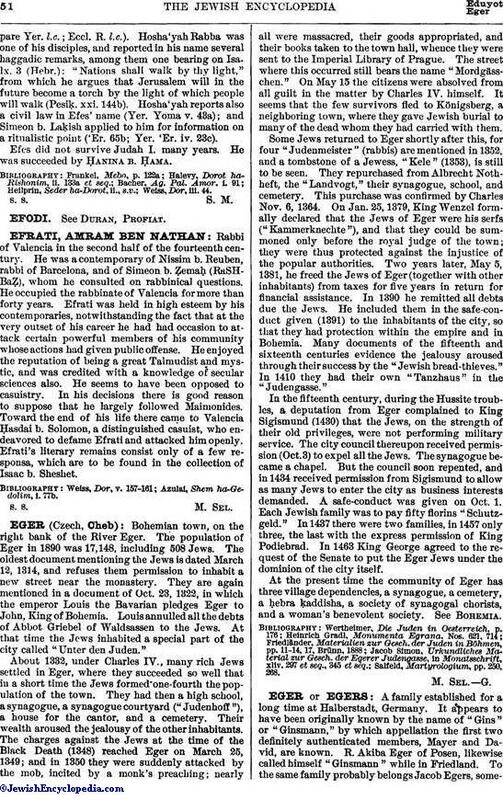 The city council thereupon received permission (Oct.3) to expel all the Jews. The synagogue became a chapel. But the council soon repented, and in 1434 received permission from Sigismund to allow as many Jews to enter the city as business interests demanded. A safe-conduct was given on Oct. 1. Each Jewish family was to pay fifty florins "Schutzgeld." In 1437 there were two families, in 1457 only three, the last with the express permission of King Podiebrad. In 1463 King George agreed to the request of the Senate to put the Eger Jews under the dominion of the city itself. At the present time the community of Eger has three village dependencies, a synagogue, a cemetery, a ḥebra ḳaddisha, a society of synagogal chorists, and a woman's benevolent society. See Bohemia. Salfeld, Martyrologium, pp. 250, 268.